I’m in a magical state of mind as I sit here and write this post this morning. The house is so quiet I can hear the fridge humming and the sun is just beginning to peek its head up on the horizon. My little rumpy is still snoozing soundly. This is such a rare moment that I keep tiptoeing back to the bedroom to check on Smith because, at this point, he is usually sprinting around the living room with one of his toys and some treasure he pilfered from my kitchen (usually an ice cream scoop or can opener these days). It’s hard to believe summer is almost coming to a close, but the window of daylight is gradually shrinking and the little pups are going back to school. I’m always ready for the changes in seasons, but I know I am going to miss the fresh flavors of summer come January. 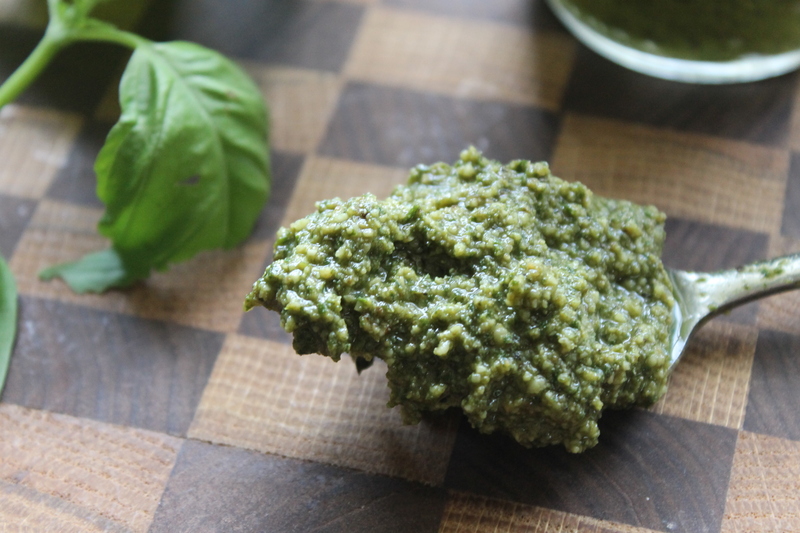 One of the quintessential summer herbs is deliciously wonderful basil. My front porch pot of this plant did great this year and, in an attempt to preserve the sunshine, I made a big batch of pesto that will (hopefully) make it into our meals this winter. Place garlic, walnuts, herbs, oil, and 1/2 teaspoon of salt in food processor. Process until smooth, about 1 minute. Scrape down the sides with a spatula and add in cheese. Process until well-incorporated, about 15 secs. Store in fridge or freeze. 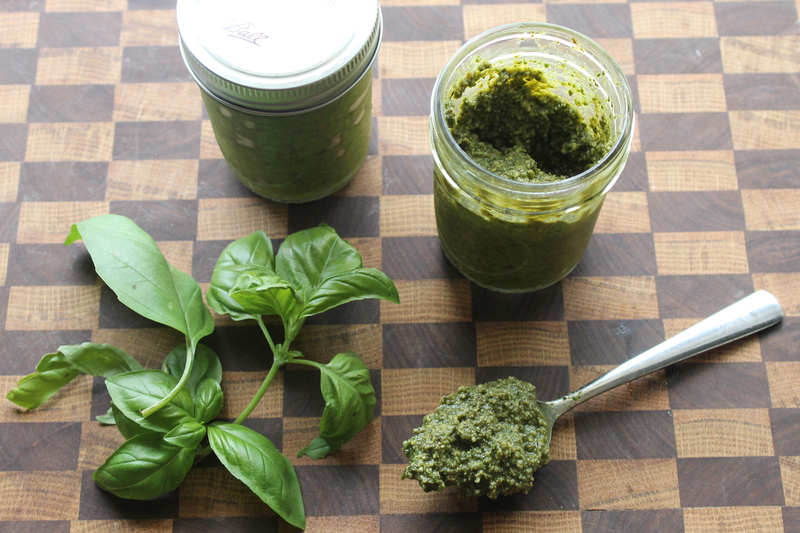 Don’t forget to add a thin layer of olive oil or plastic wrap to the top of the pesto to prevent it from browning! Enjoy. I’m about to strip and pulverize my leaves….I love having this frozen and ready. Summer!!!!! Don’t go!! !